From the team that brought you the Eisner-Award winning Mythology: The DC Comics Art of Alex Ross. Here is the beloved Marvel Universe of comics characters, brought to thrilling life as only Alex Ross can. They're all here: Spider-Man, Captain America, Iron Man, the Avengers, the Guardians of the Galaxy, the X-Men, the Fantastic Four, Black Panther, and many more--all seeming to leap, blast, and launch off the page. 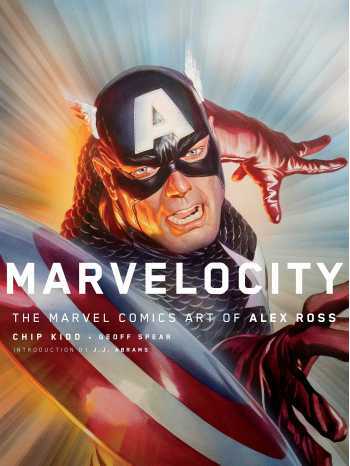 For almost thirty years, Ross has been working nonstop to create some of the most astonishing images in comics, and while Marvelocity collects the very best of that oeuvre, it's much more than that. Inside are hundreds of drawings, paintings, and photographs that have never been published before, including an original ten-page story featuring Spider-Man versus the Sinister Six, redesign proposals for the X-Men and the Fantastic Four, and a re-creation of an epic battle between the Sub-Mariner and Iron Man. But this isn't just the story of the Marvel characters--it's also the incredibly inspiring true tale of a little boy who only ever wanted to draw and paint super heroes. And with enough determination, talent, and very hard work, that's precisely what he did. Marvelocity is the result, and is sure to entrance and delight fans of all ages.